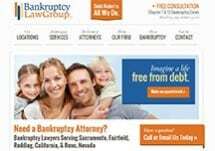 At Bankruptcy Law Group, we specialize in Chapter 7 Bankruptcy and Chapter 13 Bankruptcy Services in Fairfield, CA and the surrounding area. We won't push or pigeonhole you into bankruptcy. We work with each of our clients to help them determine the debt relief plan that is right for their situation. Chapter 7 Bankruptcy and Chapter 13 Bankruptcy are only two tools in the debt relief arsenal. There are non-bankruptcy solutions that make the most sense for some individuals depending on their situation. At Bankruptcy Law Group Fairfield, debt relief is all our attorneys do. Call 707-422-8500 or click on our Website link and schedule your Free Bankruptcy Consultation Today!